Pack size: 20 x 0.5ml resealable droppers. Clinitas Soothe Really good eye drops, like the little vials they are packaged in, makes it easy to carry them around and apply just the right amount. Would recommend Clinitas Soothe. Not as effective as they claim I bought these as a change from my normal drops because I expected them to be far more moisturising - targeted as they are at "dry eye" sufferers. To be honest, I didn't find them soothing in the least but, more importantly, I didn't find that they particularly hydrated my eye either. I found that I was having to use 4/5 drops of these to get the same effect as one drop of Refesh eyedrops. They aren't BAD as such but they aren't in any way superior to normal drops and so I feel a bit let down that they are marketed at conditions such as "dry eye"
Eye irritation is really; well, irritating, as every contact lens wearer soon learns. But there are some fabulous products available to soothe tired eyes and make lens wearing as easy as possible. Clinitas Soothe is just such a product. If you suffer from inflamed, gritty eyes, then a few drops of Clinitas Soothe could make all the difference. Intended to be applied as and when required, these handy drops will become a vision essential for anyone who uses them. • Formulated with Sodium Hyaluronate which mimics the composition of tears. This provides support for the body's own hydration mechanisms, lessening any inflammation and discomfort. • Unlike some other remedies, there is no need to remove contact lenses when using Clinitas Soothe. • The Clinitas solution is absolutely preservative free. This reduces the risk of further irritation for sensitive eyes. • Superb value for money, these eye drops come in vials which contain around 10 doses and are suitable for all forms of lens. 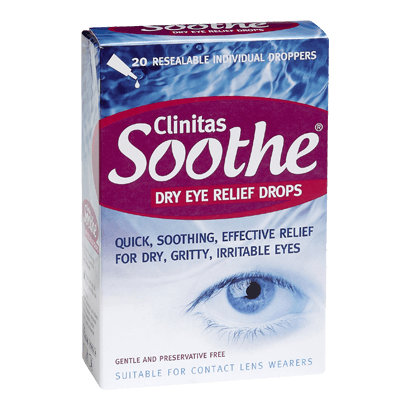 • Clinitas Soothe is manufactured by eye care company Altacor and recommended for use in conjunction with other Clinitas products for even better results. Every now and then all contact lens wearers need a boost. Dry eyes can affect any of us who use computers or machinery for prolonged periods, or travels in aeroplane cabins. If that sounds like you, Clinitas could be just the product solve your hydration worries.